I made this Oyster cake (蚝饼）or UFO two days ago and it was very delicious, the outside is crispy and inside is moist and soft. Thumbs up from my family and friends for this yummy snack. This Oyster Cake (蚝饼) is originated from Fuzhou, China. Season minced pork with 1/4 tsp sugar, 1/2 tsp sesame oil, 1/2 tsp light soy sauce, 1/2 tbsp corn flour, 1/2 tbsp water, 1/2 tbsp cooking oil and set aside. In a large bowl sift plain flour, self raising flour, rice flour and baking powder together then add in seasoning and water, mix well. Heat enough oil for deep frying and place frying ladle into the hot oil for a while. Add about 2 tbsp of batter on the frying ladle and top with some minced pork, prawn cubes, 2-3 pcs oysters and some chives/spring onion then cover with another thin layer of batter on top. Deep fry into hot oil till golden brown. **if you don’t want to use the frying ladle, you can also use dropping method ~ in a small bowl. add minced pork, prawn cubes, oysters and chives with some batter, mix well and use spoon to push the mixture down into hot oil and deep fry till golden brown. do you think i can bake instead of deep frying it ? Just tried the recipe and the oyster cakes were delicious. Thank you! Hi Lisa, Thank you for trying this recipe. You must add baking powder in the plain flour and rice flour and just add a thin batter at the bottom and the top of the filling will do. Thanks for the nice recipes and I've tried last week. The turnout was good except for the outer skin which was quite hard and thick. Is there anything to make it softer and thin? BTW, i did not add the baking powder as I thought there is baking powder in the self-raising flour. Pls help…..
Weng ~ you mean fresh mussel meat? Sounds good! Please let me know how is the outcome. Magic of Spice ~ Thanks! Spoon and Chopsticks ~ Hahaa…what a cute comment. Can't wait to see your post soon. Your UFO looks very delicious. In fact they do resemble the UFOs. I wish these UFOs fall on my rooftop. I know similar recipes made only with flour and sugar. I will try to post this on my blog when I make it. Wow!! That really does look delicious – I almost feel like reaching through the screen to grab one! Hi Anncoo, Thank you so much for linking me. 🙂 I would like to try this using mussel meat to substitute. Cause I cant find oysters here. Hehe. Will let you know soon 🙂 Thanks for sharing! Ann ~ yes, this is really yummy. Thank you Kristin & Peachkins. Sweetums ~ Thank you for your compliments. Christine ~ Thanks. You've to go to your dashboard and tick "Make Blogger in Draft my default dashboard" then in your future posting, you can download mutliple photos at one time and your photos can be set at small, medium or large. It looks so crispy & yummy! How did u upload the wide photo into your blog? Wow, what an awesome recipe! They look really yum! Fried oyster cakes, yum! They look outstanding! These looks delicious! I have never had one before but they sound yummy. I've never had this! But must be so yummy with the added oysters! Gert ~ Try this with some peanuts on top, you'll love it. Jessie ~ you're another person mentioned about the stall at Bugis. Angel ~ No problem, you can some prawns, bean spouts or carrots. Tigerfish ~ you can make this at home. Tanantha ~ oyster pancake! did you post it in your blog? Jess ~ hahaa … want to try some? Ai Ping ~ Thank you. HK Choo ~ I also used frozen oyster, try this at home, very yummy. Haven't tried this before, but yours looks so tempting and inviting I shall do it soon, without the oyster though as I doubt we have frozen oysters here. It looks really really good! I must try this out! Thanks for sharing! Happy new home! Love the fresh minimalist look, Ann! And yes, will be adding into the followers.. I've had oyster pancake before. Not sure if it's similar to this. It looks so good, tho! I have not seen this type of 炸蚝饼 for a long time now. I want some! Anncoo, this cakes look so yummie with ground pork and oysters…so tasty…love the combination! This is very addictive, Anncoo! Just can't help drooling over the pics! Wow, ur fried oyster cake looks very good, crispy outside and tender inside. But I'd like to have it w/o oyster maybe replace with veggies as I don't like the taste of oyster. 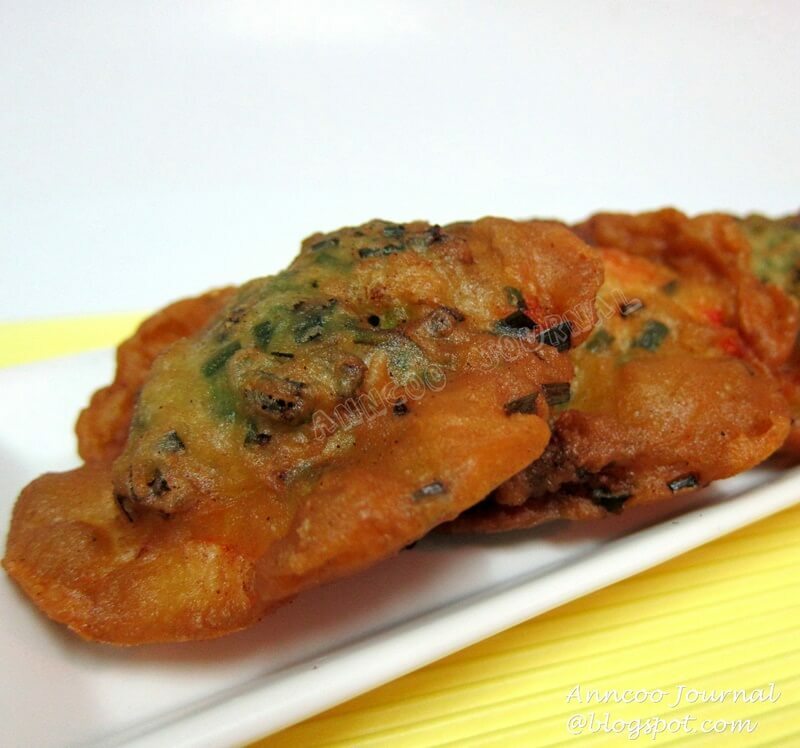 I love almost all kinds of fritters and these ones look totally delicious…!! Great job, Anncoo! I never tasted oyster cake before. From the look it is very similar to cucur udang but this one sound so much better especially with ground meat and oyster in it. Love the pictures. Petite ~ Really crispy can even add peanuts on top. FATMUM ~ The ladle is exactly the same you saw at those stalls selling oyster cake. It has a long handle and it is a flat ladle. You can get the ladle at those selling pots and pans shop. Biren ~ You must try these, I'm sure your boys will love it. Anccoo..woo…..love this! Do you need a special ladle to prepare this? Hope can make this dish for my family too. think I can easily finish 3 at a go. =p. thanks for sharing. 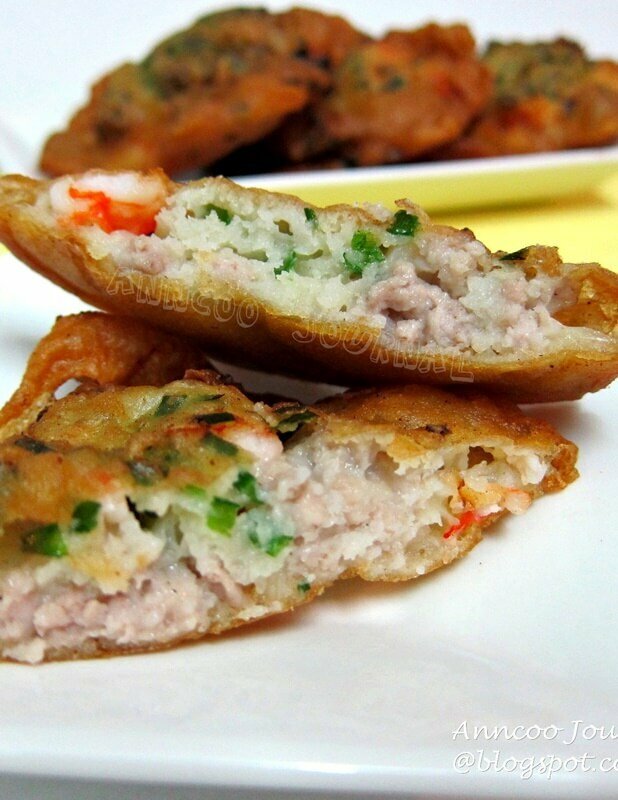 Wow, these oyster cake look really crunchy n delicious! Wish I could have some now. Yumm…..=D I love fried oyster cake! We've tried making it at home a couple of times somewhat successfully but each recipe comes out really differently. But this one is completely different and looks really really good! Must try someday! Elin ~ This oyster cake is very popular in SG, you can find them everywhere in most hawker center. Esther ~ Just buy the frozen oyster from NTUC, thaw and use colander to wash quickly and drain. Little Inbox ~ Try this, really good. HHB ~Thanks! Your Mum must be a great cook too. I don't know there is a stall in Kitchener Rd, except Clementi and Maxwell Rd. Sonia ~you can use the same batter for prawns and bean sprouts or any other ingredients you like to add. Tangled Noodle ~ hahaa…not too many, can cause you sore throat. BeeBee ~ I was quite lazy making this at first but my hubby request. Is faster to use 2 ladles and for the last few pieces I used dropping method. Christine ~ I know many people love this a lot. Sharon ~ Oh..is there a stall in Bugis? Mary ~ you're right, cannot eat too many because very heaty stuff. Lequan ~ Try this, use the same batter and add any ingredients that are easily cooked. Chris ~ not necessary to add oyster, add vegetables like carrot, bean sprouts and prawns. Jane ~ You mean the popular stall at Maxwell Rd right? The stall still there and now the daughter in charged. I still buy from her sometime but the '福州饼' has lesser ingredients now. Now you make me feel hungry! I like this very much, didn't know can use frozen oyster to make. oysters in any dish, how can you go wrong! Beautiful! Thumb up! Yummy yummy…..!!! Ann, last time i used to walk all the way fr Raffles Place to 牛车水 to buy this “福州饼”. So many yrs din hav it ady， 10+ i think. I like this but less the oyster.